As you can see in the Shape panel, texts have most of the same options as Curves. The surface resolution in the U direction to use in the viewport. The surface resolution in the U direction, set to zero to use the Preview resolution. Determines the way a Curve is filled in when it is extruded and/or beveled. Fills in the front side of the surface. Fills in the back side of the surface. Fills the curves after applying all modification that might deform the curve (i.e. shape keys and modifiers). Does not fill polygons while editing text. Alters the space between letters. Will extrude the text along both the positive and negative local Z axes. 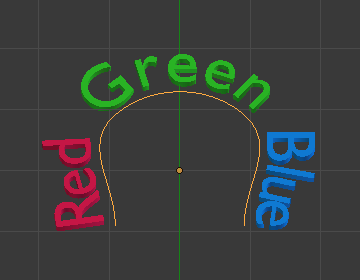 Used to select a curve object that can be used to cause the characters to get thinner towards one end. You can also alter the proportions of the Taper throughout the tapered object by moving/scaling/rotating the Control Points of the Taper Object. The Taper Object can only be a curve. Editing the Handles and Control Points of the Taper Object will cause the original object to change shape. Used to select a curve object that can be used to give custom bevel results. Curve geometry for more details and examples. The Font panel has several options for changing the look of characters. 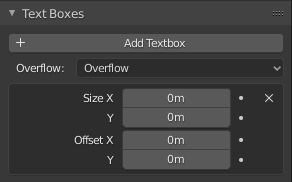 Blender comes with a built-in font by default that is displayed in each of the four font style data-block menus. The built-in font is always present and shows in this list as „Bfont“. The data-block menu contains a list displaying the currently loaded fonts. Select one for each font style. To load a different Font, click one of the Load buttons in the Font panel and navigate to a font file. The File Browser will give all valid fonts a capital „F“ icon. If you select a font that is unsupported by Blender, you will get the error Not a valid font. Fonts are typically located under /usr/lib/fonts, or some variant like /usr/lib/X11/fonts, but not always. They may be in other locations as well, such as /usr/share/local or /usr/local/share, and possibly related sub-trees. Remember the same font will be applied to all chars with same style in a text, but that a separate font is required for each style. For example, you will need to load an Italics font in order to make characters or words italic. Once the font is loaded you can apply that font „Style“ to the selected characters or the whole object. In all, you would need to load a minimum of four different types of fonts to represent each style (Normal, Italics, Bold, Bold-Italics). 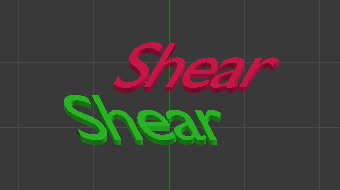 It is important to understand, that Blender does not care what font you load for „normal“, „bold“, etc., styles. This is how you can have up to four different fonts in use in the same text, but you have to choose between different styles of a same font, or different fonts. 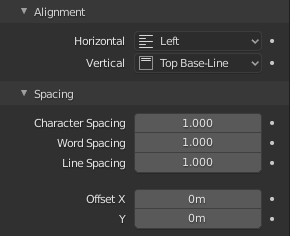 Blender has a number of typographic controls for changing the style and layout of text, found in the Font panel. Controls the size of the whole text (no way to control each char size independently). Note however, that chars with different fonts (different styles, see below) might have different visible sizes. Controls the inclination of the whole text. Different to as it may seem, this is not similar to italics style. First, you must create your chars. Each char, of any type, is an object (mesh, curve, meta…). They all must have a name following the schema: common prefix followed by the char name (e.g. „ft.a“, „ft.b“, etc.). Then, for the Text object, you must enable the Dupli Vertices button (Object ‣ Animation Settings panel). In the Font tab, fill the Object Font field with the common prefix of your „font“ objects. Now, each time a char in your text matches the suffix part of a „font“ object’s name, this object is duplicated on this char. The original chars remain visible. The objects are duplicated so that their center is positioned at the lower right corner of the corresponding characters. Used to select a curve for the text object to follow. You can also use the Curve Modifier which offers more control. Toggled with the Underline button before typing. Text can also be set to Underlined by selecting it then using the Underline button in the Tool Shelf. This allows you to shift vertically the position of the underline. This controls the thickness of the underline. Toggled with the Bold button before typing. Text can also be set to Bold by selecting it then using the Bold button in the Tool Shelf. Toggled with the Italic button before typing. Text can also be set to Italic by selecting it then using the Italic button in the Tool Shelf. Enables underlining, as controlled by the Underline settings above. Blender’s Bold and Italic buttons do not work the same way as other applications, as they also serve as placeholders for you to load up other fonts manually, which get applied when you define the corresponding style; see Font. To apply the Bold/Italics/Underline attribute to a set of characters, you either turn on Bold / Italics / Underline prior to typing characters, or highlight (select) first and then toggle Bold/Italics/Underline. You can change the text case by selecting it then clicking the To Upper or To Lower in the Tool Shelf. Enable the Small Caps option to type characters as small caps. The size of the Small Caps can be changed with the Small Caps Scale setting. Note that the Small Caps Scale is applied the same to all Small Caps formatted characters. The Paragraph Panel has settings for the alignment and spacing of text. Aligns text to left of frames when using them, else uses the center point of the Text object as the starting point of the text (which grows to the right). Centers text in the frames when using them, else uses the center point of the Text object as the mid-point of the text (which grows equally to the left and right). 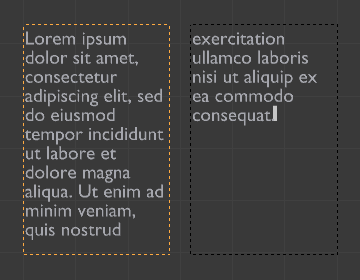 Aligns text to right of frames when using them, else uses the center point of the Text object as the ending point of the text (which grows to the left). Only flushes a line when it is terminated by a word-wrap (not by Return), it uses white-space instead of character spacing (kerning) to fill lines. Always flushes the line, even when it is still being entered; it uses character spacing (kerning) to fill lines. Both Justify and Flush only work within frames. Aligns the text base-line to top of frames when using them, else uses the center point of the Text object as the starting point of the text (which grows to the bottom). Aligns top of text to the center point of the Text object (which grows to the bottom). It behaves as Top Base-Line when using frames. Top only works without frames. Centers text in the frames when using them, else uses the center point of the Text object as the mid-point of the text (which grows equally to the top and bottom). Aligns text to bottom of frames when using them, else uses the center point of the Text object as the ending point of the text (which grows to the top). A factor by which space between each character is scaled in width. A factor by which white-space between words is scaled in width. You can also control it by pressing Alt-Left or Alt-Right to decrease/increase spacing by steps of 0.1. A factor by which the vertical space between lines is scaled. These settings control the X and Y offset of the text, regarding its relative positioning. Note that with Text Boxes, it applies to all frames‘ content. Text „Boxes“ allow you to distribute the text among rectangular areas within a single text object. An arbitrary number of freely positionable and re-sizable text frames are allowed per text object. Text flows continuously from the lowest-numbered frame to the highest-numbered frame with text inside each frame word-wrapped. Text flows between frames when a lower-numbered frame cannot fit any more text. If the last frame is reached, text overflows out of it. Specifies the Width and Height of the frame. If set to zero no word-wrap happens. Controls the X and Y offset of the frame. Inserts a new frame, just after the current one (in text flow order). The new frame will have the same size and position as the selected one.